Several months ago, a sweet friend, Moriah from BluMudd put the call out for some folks to use some of her BEAUTIFUL pieces, create something, send 1 photo to her by Sept 1 and she'll put those pieces up for a public vote and the winner receives at $50 gift card to her store. Who am I to not participate in something so fun and challenging? SO, I jumped in. Little did I know what kinda challenge this would be. Oh MY! This is the color combo I received. Gorgeous, right? I struggled. I struggled and did I mention that I struggled? I just was so..... overwhelmed. Anything I put with the leaf just looked......eh. I tried this shape, that shape, this color, that color, this texture or that texture....just nothing I used looked....good. I started to be resigned to the fact that I wasn't going to LOVE my piece and decided I just needed to do *something*. 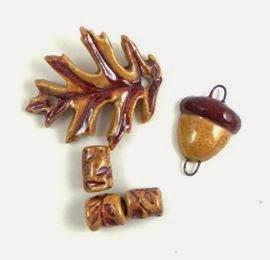 I started with some seed beads, some copper, attached this and that.... and finally it hit me! A CUFF! I could make a CUFF! Wait....I don't have any skinny gold wire. CURSES! Digging ensued....I looked here there and everywhere when I realized that I DO have some skinny wire..... A few months ago, I joined one of those monthly box services where you pay an amount and they send you something special....there are boxes of makeup, skin products, baby products, and CRAFTS! I had signed up for the crafts one and they sent me a project which I didn't really like, BUT the pieces that they sent included a GOLD CUFF and GOLD WIRE! WOOHOOOO! 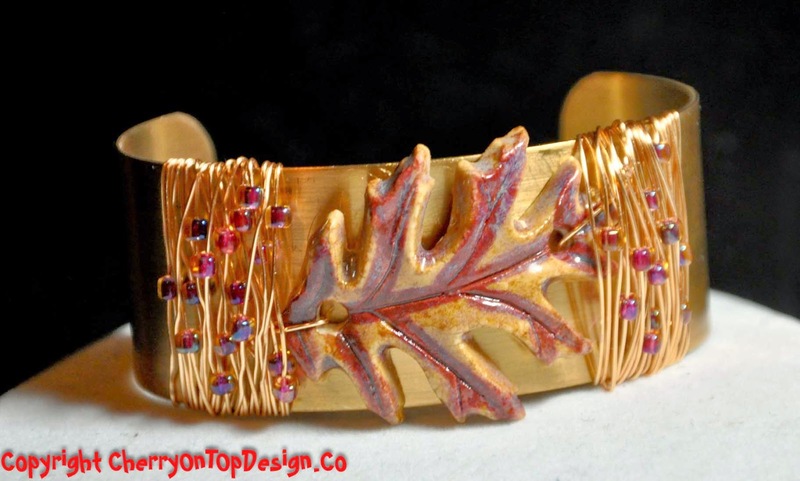 I put the leaf in the center of the cuff and attached it with some fine gold wire. I added some adorable miyuki seed beads for some texture and to bring a little pop to the rest of the piece. After a few more iterations, I added some green mesh while I didn't submit it for my final design, I REALLY like the pop that the green adds. I could have re-submitted but felt like I'd already sent my image, so it was too late. Let me know which you prefer? Both are lovely, but I like the green background better. Nice! 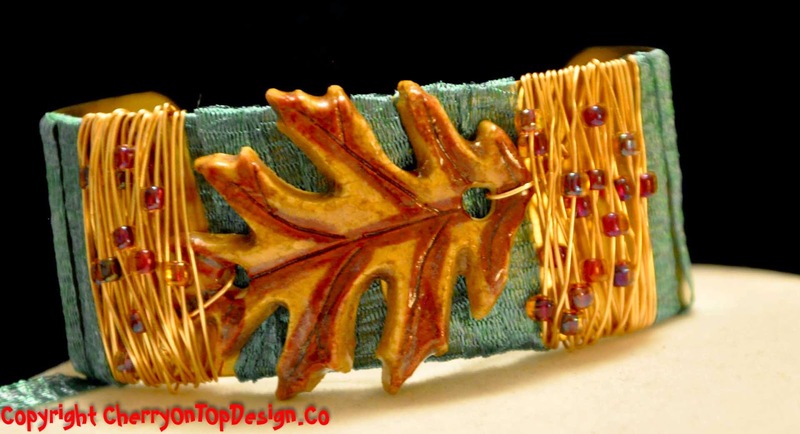 That leaf bracelet cuff is awesome. I have NO talent with cuffs. At all!